What is Mindfulness Yoga II? Read more about What is Mindfulness Yoga II? Bodhiyoga "Mindfulness Yoga" draws strongly from the teachings on "metta" or loving kindness and "sati" or mindfulness - especially as outlined in the Satipatthana Sutta - ideas and practices which come from the earliest strata of the Buddha's teaching as recorded in the Pali Canon. Read more about What is Mindfulness Yoga? I love going on retreat. I make sure I go on retreat at least once a year to keep my mind and body in check. As such, it kinda surprised me when I turned into Grumpy McGrumpster from the onset. Even before I had landed in Spain I was grumpy. No, actually, even before I had boarded the plane at Birmingham I was grumpy. A gaggle of girls were also boarding my flight full of giggles and fun times ahead on their journey to sun, sand, sea and booze. I couldn't help wanting them to shutup and let me be grumpy in peace. ACCOUNT OF HOW MY TEACHING IS ALIGNED WITH THE PRINCIPLES OF SATYA, AHIMSA AND SVADHYAYA, I.E. HOW IT IS SAFE, GROUNDED IN MY PRACTICE AND MY STUDENTS’ PRACTICE, AND HOW IT IS TRUTHFUL. 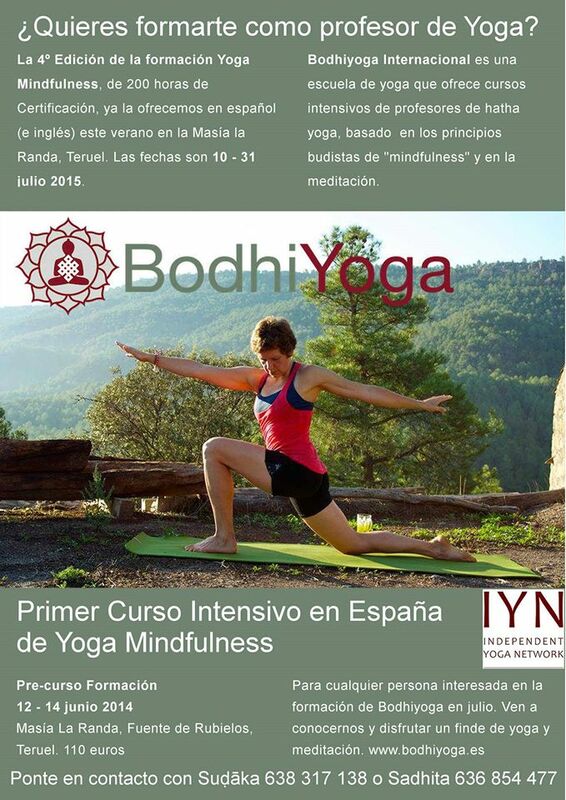 Fantastic retreat which gives a good grounding in mindfulness and mindfulness based yoga. The retreat offers the right level of challenge versus support and I totally trusted Sudaka and Sadhita and their friendly approach. Absolutely glorious. Gaelle Tuffigo, London, U.K.
Review of the 500 hour Teacher Training, June 2014, in Solterreno by Jo Newman, Birmingham, U.K. I came across Bodhiyoga in 2012, attending a yoga retreat at Ecodharma, and was incredibly inspired by Sudaka and Sadhita's teaching, which was grounded specifically within a mindfulness and buddhist context. In 2013 I gained my 200hour certification from Sun Power Yoga Teacher Training, a course which gave me a rich and firm grounding in the practice, and since qualifying I have been teaching regularly across Birmingham. Read more about Review of the 500 hour Teacher Training, June 2014, in Solterreno by Jo Newman, Birmingham, U.K.